Our range of products include industrial quartz infrared heater, quartz infrared heater, short wave infrared heater and glass heater. We are instrumental in providing quality approved Industrial Quartz Infrared Heater. The offered quartz infrared heater is manufactured under the guidance of diligent professionals who utilizes top-notch quality raw material and advanced technology in adherence to set quality standards. This quartz infrared heater is stringently tested on various quality parameters to ensure high performance at users end. Furthermore, clients can avail this quartz infrared heater in various models at affordable prices. 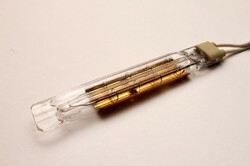 We manufacture and supply superior quality medium wave Quartz infrared heater that consists of a helically wound resistance coil housed in a pure vitreous silica fused quartz tube. The quartz tubing is terminated with ceramic insulating caps that are specially designed to allow the quartz tubing to breathe. The ceramic caps are tightly fastened to the quartz tube with high-temperature cement that allows the quartz to breathe. Our twin tube fast medium wave infrared heaters has a filament tungsten wire and this tube is filled with halogen gas. The round ceramic base of this heater has a lead wire of 500mm size (One end or two ends) & it is also configured with lead and insulated wires. Clients can avail from us high quality Short Wave Infrared Heater. The offered sort wave infrared heater is precisely designed and manufactured using premium quality raw material and sophisticated technology in compliance with international quality standards. 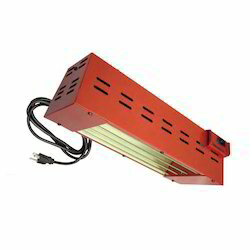 This sort wave infrared heater is rigorously tested on various quality parameters to ensure high quality. Further, clients can avail this sort wave infrared heater in various models at affordable prices. 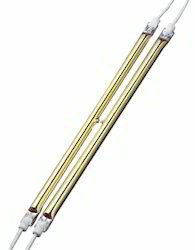 We Are Manufacturer Of Glass Heater. Looking for Infrared Heater ?